We Gilflurts have never been a tall family and so ducking to get through doors, sleeping with our toes over the edge of the mattress and being able to dust the crown moulding are all a mystery to us, but not to our guest today. 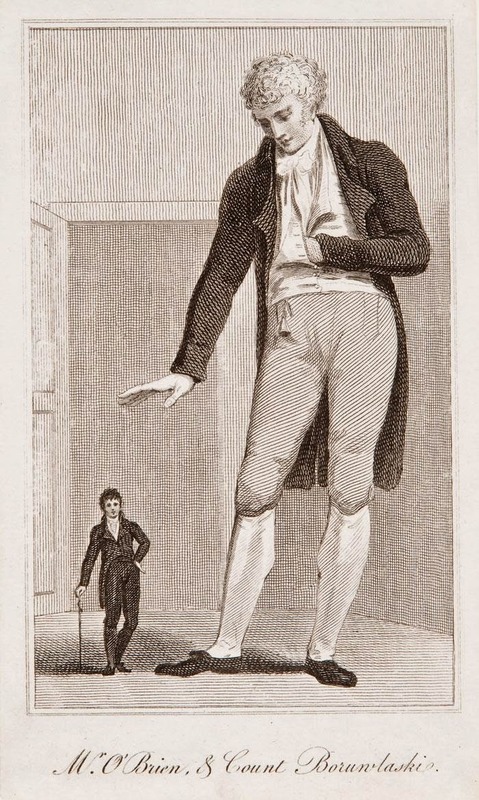 Born in County Cork in 1760, Patrick Cotter (he added O'Brien to his stage name later), grew to a massive eight feet or more in height and became known to his adoring audience as the Irish Giant and the Bristol Giant. Cotter did not fare well physically as a result of his immense height and was said to have a most singular and disproportionate appearance. When he moved his bones could be heard creaking and grinding yet he had an eye on the big money that might be made from his remarkable size and knew that his body was his greatest asset. Inspired to take the stage name O'Brien by another giant who he met early in his career, Cotter exhibited himself across the United Kingdom to paying audiences who came to marvel at the giant before them. At the start of his career, he often despaired at the situation in which he had been placed. However, eventually he was able to settle these anxieties and was known as a true gentleman, profession, polite and modest too. Cotter's health was never robust and in time his legs became so swollen and malformed that even walking was difficult. To this end, he travelled in a specially adapted carriage and soon became a well-loved figure throughout the country. Sadly, his health failed so quickly that by the age of 45, Cotter was retired and the following year, he died. The Irish Giant was placed in a coffin of more than nine feet and a team of fourteen men were employed to see it safe into his grave on Trenchard Street in Bristol. Here an enormous crowd gathered to pay their last respects to Patrick Cotter. Afraid that his remains would be taken by physicians, he had asked that he be buried in twelve feet of rock and this last wish was granted though he would not remain undisturbed forever and, in 1972, was exhumed for research purposes. Cotter left £2000 to his mother in his will and his immense arm is still preserved at the Medical Museum of the Royal College of Surgeons in London, a sad fate for a gentleman such as he. Fascinating. I love that you capture his personality so well. Thank you; he's a favourite character of mine! My hometown's 'Gentle Giant,' Robert Wadlow reached 8'11" at his death at age 22..and he was still growing. He, too, suffered greatly because of his height. It isn't until you stand beside a life-size statue that you realize just how large they really were and how difficult it must have been for them to try and adapt to a world made for people so much smaller. It's so sad that they suffered so, each day must have been a struggle.